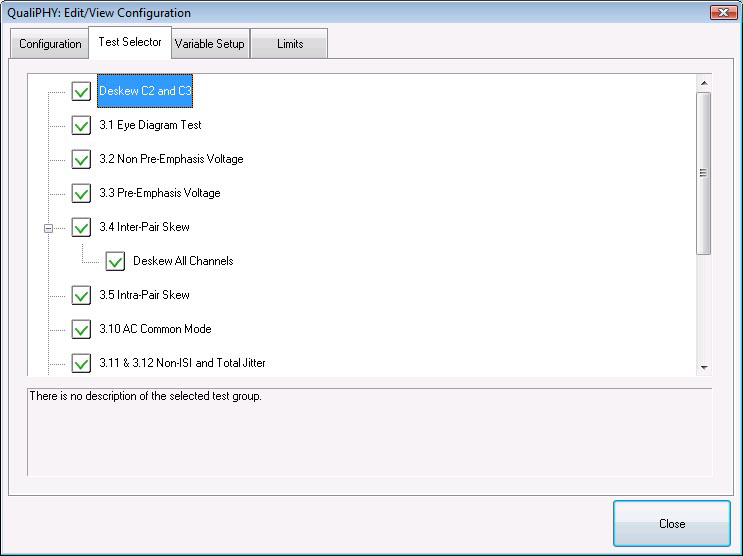 The QPHY-DisplayPort software option provides an automated test environment for running all of the normative real-time oscilloscope tests for sources in accordance with Version 1.2b of the Video Electronics Standards Association (VESA) DisplayPort PHY Compliance Test Specification, as well as tests for HBR3 signals at 8.1 Gbps as defined in the DisplayPort 1.3 Electrical Specification. In order to get a DisplayPort source to market, compliance to the DIsplayPort compliance test specification must be demonstrated by testing at either a DisplayPort Plugfest or a certified test lab. Using QPHY-DisplayPort to ensure that a device will be ready to pass all required compliance tests allows for the quickest turnaround and fastest time-to-market. 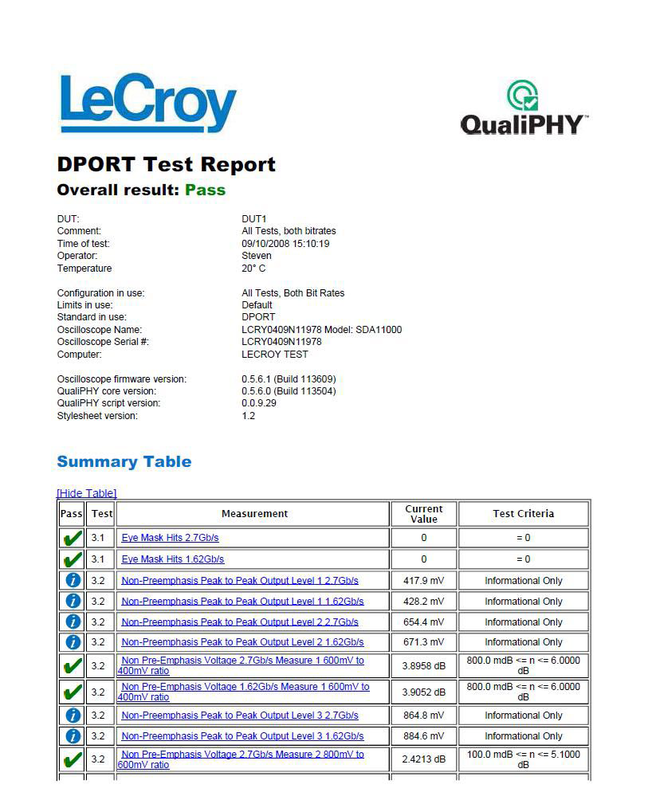 QPHY-DisplayPort makes the process of performing DisplayPort compliance testing extremely quick and easy. 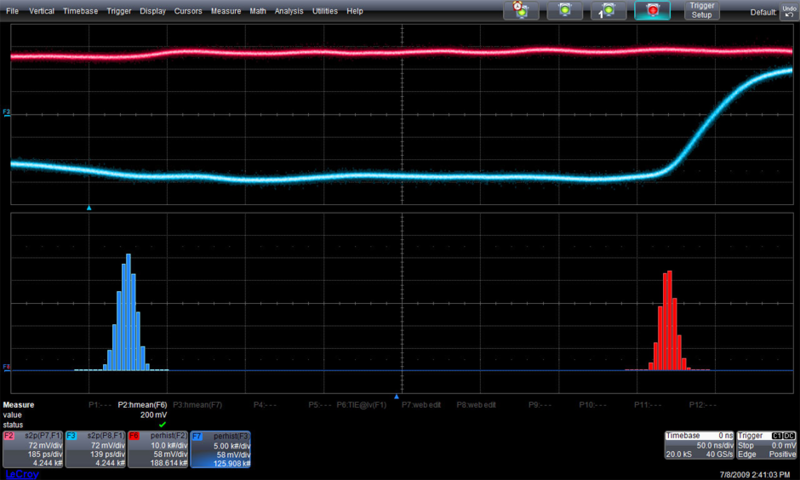 The test script supports automatic DUT configuration via connection to a Unigraf DPR-100 acting as an AUX controller. 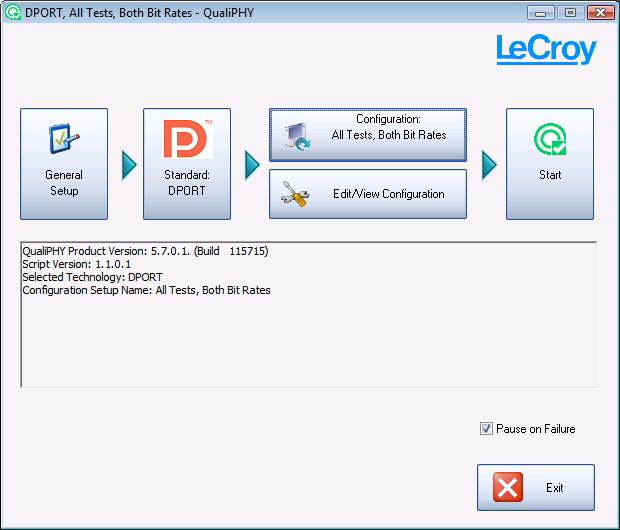 Users only need to click “Start” in order to perform a test that automatically cycles through all DUT settings, including bit rate, swing, pre-emphasis level and SSC and sets the required test pattern. 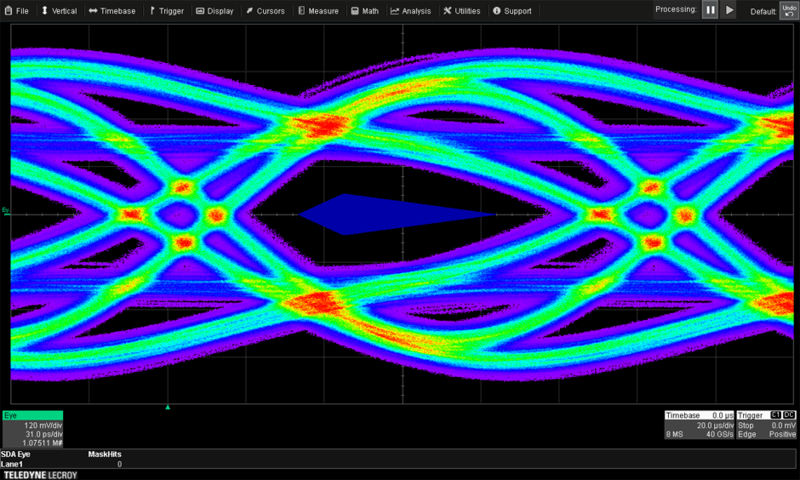 When a problem is detected, use the power of the serial data analysis tools to help find the root cause of excessive jitter or eye diagram failures. Typically, compliance testing is a very difficult task. 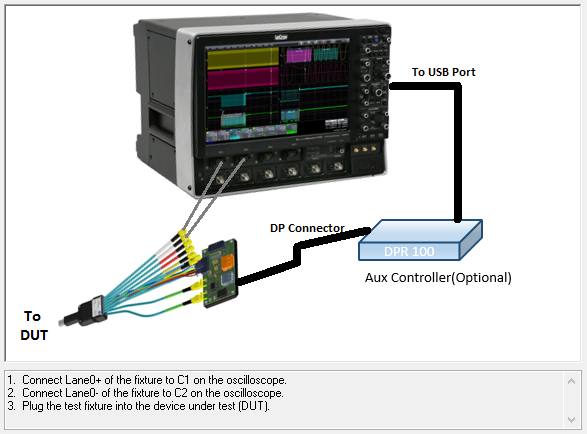 The user must make the necessary connections between the oscilloscope and the device under test, manually configure the oscilloscope for the appropriate measurement, perform the test procedure as specified by the test specification, record the results and finally compare the results to the appropriate limit in the compliance specification. QPHY-DisplayPort does many of these steps for you automatically. Measurement results often need to be summarized and tabulated to quickly verify specifications. This information, together with instrument and signal acquisition/test condition setups, results in a fully documented record. QPHY-DisplayPort streamlines this process by incorporating an automatic HTML report generation engine. The created test reports contain tabulated numerical values for each individual test result, including PASS/FAIL and specification limit columns. Reports can also be saved as PDF, HTML or XML. If a compliance failure is found, Teledyne LeCroy’s SDAIII-CompleteLinQ family of serial data analysis packages is available to help find the root cause quickly and easily. 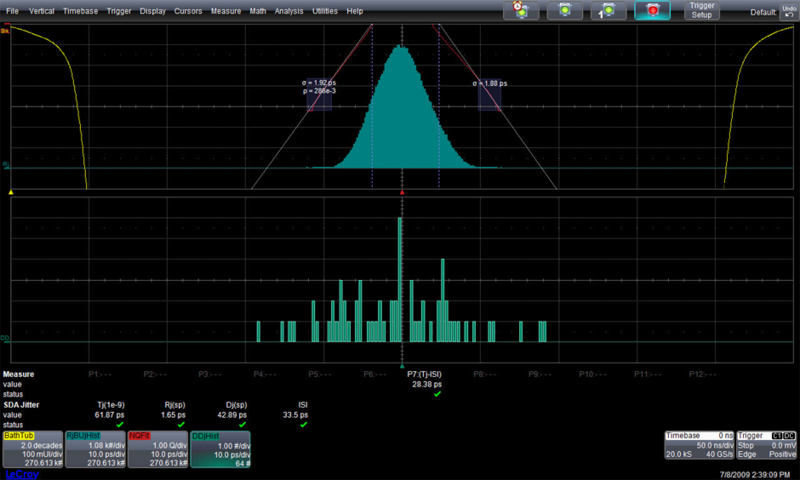 SDAIII-CompleteLinQ has the ability to compare eye, jitter, and noise measurements on up to four lanes simultaneously. In addition, SDAIII-CompleteLinQ provides insight into the measured eye and jitter parameters – making it easier to identify the sources of problems.